The PNY CS1100 SSD is a quick and cost-effective upgrade that brings new life to your computer. Built with premium MLC flash, advanced controller and SATA III interface, the CS1100 series offers significantly faster sequential/random read/write speeds than traditional mechanical HDD - OS loads in seconds, apps start up in an instant, and all your operations are smooth and fluid. PNY's extensive testing and rigorous validation process ensure compatibility across various platforms and multiple Operating Systems. Along with low power consumption, vibration resistance and quiet operation inherent in SSD storage, the PNY CS1100 SSD will improve your computing experience on your laptop/desktop. Experience blazing fast performance when you upgrade to a PNY SSD from a traditional hard disk drive (HDD) - for PC performance that's up to 24x faster. 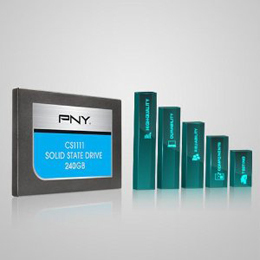 PNY SSDs feature no moving parts to complete random operations rapidly. Get faster boot up time, enabling your PC to not only perform better, but to feel like a brand new computer for years to come. Applications launch quicker than ever and programs load in seconds, for a better overall computing experience. All PNY SSDs undergo extensive component and sub-system testing. PNY utilizes high-quality NAND from the industry’s top vendors to ensure a solid SSD. These SSDs are validated across applications and environments to ensure they meet the highest quality, reliability, and durability criteria. 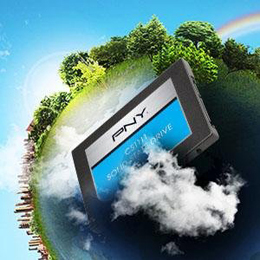 With stringent endurance standards in place, PNY SSDs ensure trouble-free performance you count on. The same components that offer high performance also undergo some of the most rigorous durability and validation testing in the industry. PNY SSDs withstand hundreds of pre-release qualification tests and over ten thousand hours of validation testing. 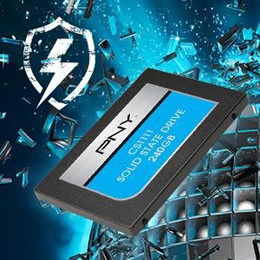 PNY provides you with the assurance that each SSD meets the requirements of even the most demanding applications. Transform the everyday use of your PC by upgrading to a PNY SSD and experience superior performance, incredible endurance, enhanced reliability, and high efficiency power management. 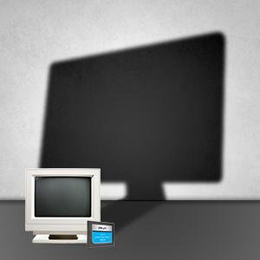 Enhance your existing PC from the inside out. 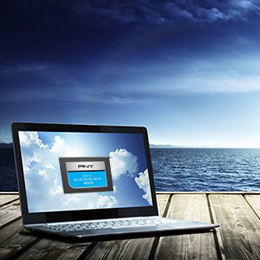 PNY SSDs enable cool and quiet operation, ultimately increasing the life of your PC. With no moving parts, The SSDs generate less heat than an HDD, reducing operating temperature and potential damage from overheating. Along with a lower temperature, SSDs don’t produce any noise, and can make your PC significantly quieter. With significantly less power consumption than HDDs, PNY SSDs have no moving parts, feature low-wattage, and function with an advanced lower-power mode. On average, PNY SSDs consume 30% less power than HDDs. If you’re aiming to build a silent, green PC, PNY SSDs are a must have item on your checklist. Tougher than an HDD, PNY SSDs are up to 30 times more robust and can better withstand, bumps, falls, and feature no moving parts - making it less likely to fail. PNY SSDs thrive and survive in extreme environments, high and low temperatures, high humidity, and the non-volatile NAND in the system enables the SSD to retain its memory in case of impact and shock if your computer ever falls or is dropped. PNY is an SSD solution provider across Enterprise, Client, and Consumer products, with lifecycle product management to JEDEC standards. With a world class SSD engineering team, PNY's Storage Solution team is based in Silicon Valley, ensuring they are well positioned to take advantage of emerging technologies. 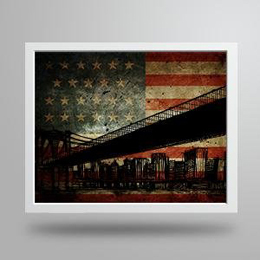 PNY is a global technology leader committed to creating and keeping jobs in the United States. With the headquarters and state-of-the-art manufacturing facility in Parsippany, N.J., more than 80 percent of PNY's global workforce works right here in the USA. PNY SSDs are designed, developed, and assembled in the USA. The PNY CS1111 2.5-inch SATA III (6 Gb/s) SSD is the next generation of Optima SSD. It is an excellent choice for an entry-level solid state drive (SSD) upgrade from the hard disk drives (HDD). 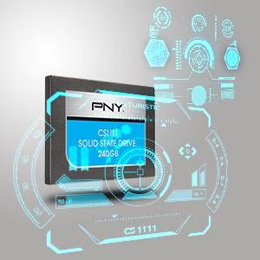 PNY CS1111 is designed for an easy and cost-effective HDD replacement in the existing PC system that helps realize faster boot times, quick application launch and great overall system storage performance improvement in a cost-effective way compared to the HDD. With no moving parts, PNY CS1111 is highly durable, less likely to fail. The PNY CS1111 is power-efficient and helps extend the battery life lasting longer than a HDD at a competitive price point. These SSDs are available in a range of capacities from 120 to 480GB using MLC NAND flash memory. It's extensive testing ensures compatibility across various platforms, multiple Operating Systems and applications that just work hassle free right out of the box. 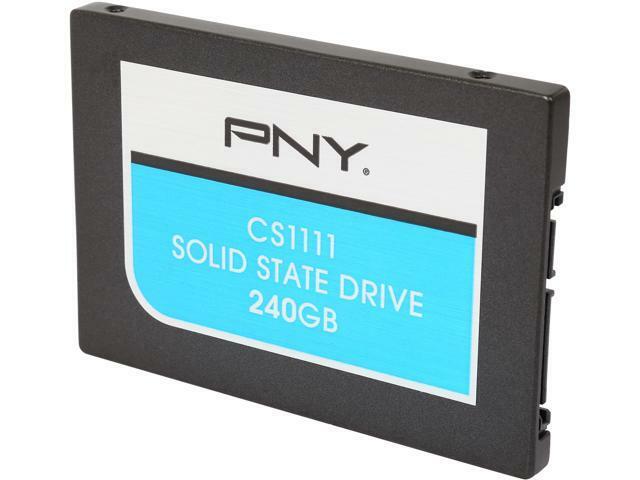 The PNY CS1111 SSD is the best choice for the entry-level price conscience consumer looking to upgrade their HDD to SSD for faster boot up, quicker loading of applications and power saving for longer battery life. 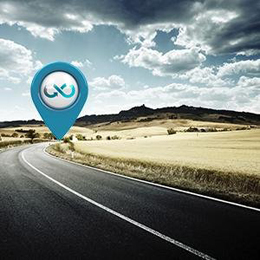 The easy installation guide and bring up helps reap the upgrade benefits right away. I figured when I bought it that if I eventually need more hard drive space I can install another one in a Raid array and take advantage of the increased bandwidth for faster speeds. Cons: Not the fastest transfer rates of the ssd's available. At $85 I would've went with something else, but at 65 it's too much of a value to pass up. Other Thoughts: Keep a back up of your hard drive Just in case. I upgraded to Win 10. And it almost locked me out of my desktop permanently. Other Thoughts: Do not use this in an HP G series laptop. You will get a smart hard disk error even though the drive is probably fine. Replacing with other brands works fine. Cons: PNY has no service department. So, if you think you will need any help with anything, especially an RMA, look elsewhere of for a different SSD. My PNY SSD went dead on me. I went to the PNY website and filled in the form for an RMA. Three days later I got an email asking me to fill in a questionnaire about my customer experience. I filled it out and commented that I had not heard anything about the RMA. I got no response. After over a week of waiting, I called their "Tech support" line. You don't get to talk to anyone. Leave your name and number. I have now waited 3 days and no return call. Yesterday I sent an email to "tsupport@pny.com", because I saw that email listed here as an answer to another person. 28 hours later, I have received no response. Other Thoughts: I will never buy another PNY product and, if you are considering something sold by PNY, you have been warned. If you have any problems at all, you WILL be ignored. Their 3 year warranty is useless, if they will not even communicate with you. Might as well be a 300 year warranty. Either one is worthless. PNY would like to apologize for the inconvenience our Solid State Drive has caused you. Please be aware that PNY offers a minimum 2 year warranty (4 years with registration) on all our Solid State Drives. Please contact our tech support at 1-800-234-4597 or email tsupport@pny.com for assistance or replacement of your Solid State Drive. I was slightly disappointed with the 4k single read/writes, but how often does Microsoft OS and applications ever have just a single request from a drive? I am happy with what I got and because of the price (about 25 cents a GB) I suggest this to others. Other Thoughts: Popped it out of the box and into my case! I am using it in conjunction with a smaller SSD (120) using the 120 for the OS and the 240 for games. Cons: I have received a blue screen with an ecc error rate within the 3rd month of owning this. I have contacted the manufacture left muttiple messages and has not called me back. Other Thoughts: want my money back for a regular mechanical 1tb same price no ecc error rate blue screen. PNY apologizes that our CS1111 240 GB SSD did not perform to your expectations. This SSD comes with 1 year of warranty and additional 2 years upon registration at pny.com. PNY stands by its warranty and we will replace (or repair) the product if found defective. Please reach out to our technical support team at 1.800.234.4597 or tsupport@pny.com for assistance. Pros: This is my first experience using a solid state drive as my primary hard drive, and it works great. Super fast and none of that clicking you get with standard hard drives. Cons: Unless you're only running office docs and browsing the web, you'll want to be sure to have a normal hard drive. Other Thoughts: I have only been using it as an external drive so I dont get the full speeds I would if it was installed inside the computer. But it's done great for running multiple VM's from my laptop.